One minute after doors opened. SECONDS before doors open at a suburban Aldi supermarket in Melbourne's northern fringe, an employee emerges grinning madly. In front of him are more than 100 sleep-deprived customers, some of whom have been waiting over an hour in the cold for doors to open just to get their hands on price-slashed special buys. "Thank you for waiting," he says. "We've worked very hard and have enough stock for all of you. Please be respectful and patient." Then, as doors opened, it was clear his message had fallen on deaf ears. But that's what the annual snow gear sale is all about. People don't come to be polite and courteous. 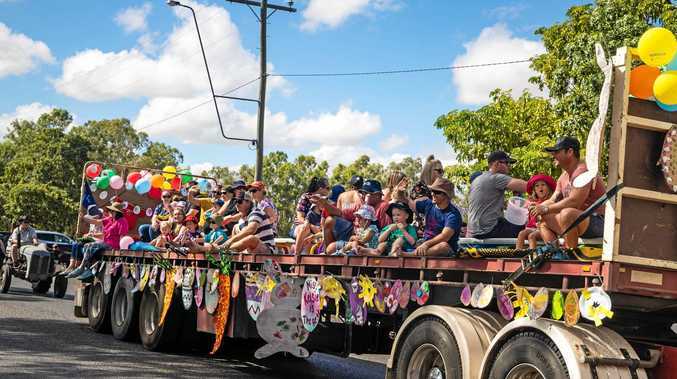 One of the most popular events on the Aldi special buys calendar rolled around again on Saturday morning touted as "bigger and better than ever". The line snaked around the store at Preston South on Saturday morning. Lessons had clearly been learnt from previous years where those who missed out left disgruntled and angry. Last year, teams even worked together to hoard items so they wouldn't be left wanting. 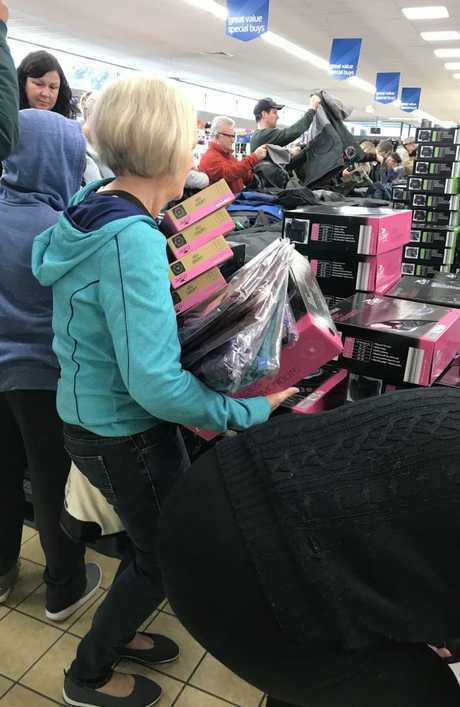 At locations around the country, shoppers got in early. They lined around the block in some locations and pulled kids out of bed to tag along. In the centre of every store, giant baskets were filled with jackets, pants, goggles, boots and underlayers. More than 50 ski-related items included men's and women's jackets for under $40, goggles from $14.99 and gloves for as little as $5. "This is nuts," a customer told news.com.au this morning. "I've never been in a line like this for anything before." Others said they were willing to brave the cold to, well, stay warm in the cold without breaking the bank. "It's not as bad as I thought it would be," one customer said. "I was worried about the line so got here super early." Lines moved quickly at the store in Preston South and customers raved about how well organised they were elsewhere. "Well done to the Mornington Peninsula store," Mishie Ivy wrote on Aldi's Facebook page. "They were fantastic ... shop was set out in an easy to find way. No issues. No fighting. Especially dealing with a crowd that was over 100 people." But not all customers played fair. 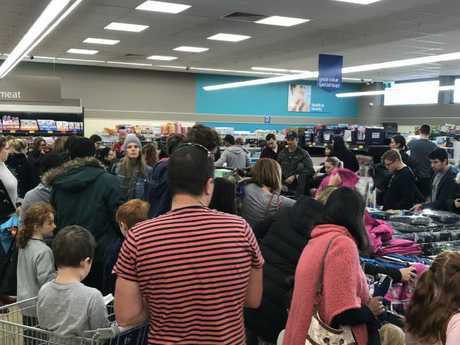 Emily Wood told news.com.au that her and her mum arrived at the Aldi store in Maroochydore in Queensland before it opened hoping to grab some gear for a trip to New Zealand. They got everything they wanted in the end, but weren't too pleased with what they saw. 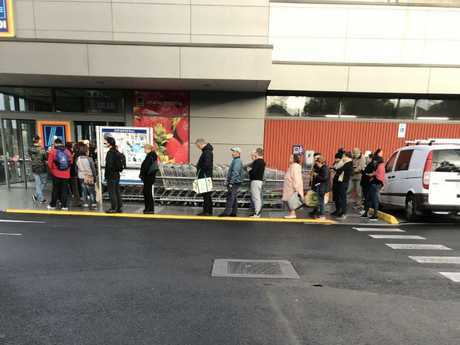 "We arrived at Aldi at 7.45 and the line had already filled the car park," she said. "We sat in the car for a while debating whether we should even bother trying and decided we may as well. We saw lots of kids and mothers with trolleys looking ready to fight it out to the death. "There was at least 100 people in front of us and when the doors opened we were expecting to hear running and screaming but it was so relaxed. "My mum and I managed to score everything we wanted which included thermals, boots, gloves and ski jackets. We decided to try them on in the different aisles with a bit of space. "I started to notice a lot of trolleys being filled to the brim with things and I saw people going through their trolleys, trying things on and dumping stuff they didn't want. 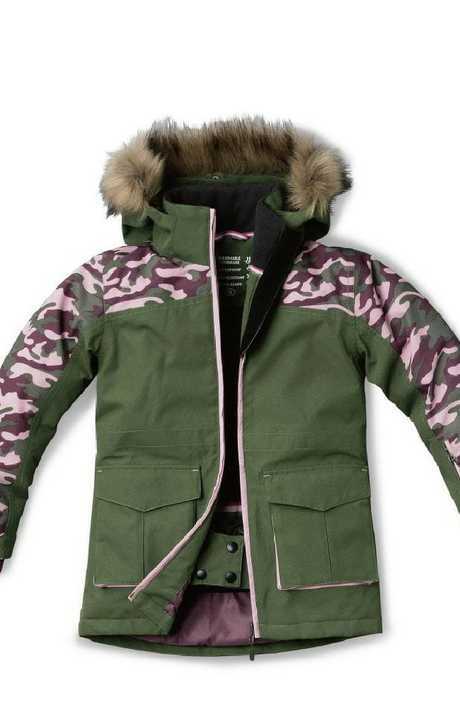 The girls’ snowboard jacket has a faux-fur lined hood. "They had clearly gone in with a trolley, scooped up an armful of the same thing and hoped that their size was there. I found this a tad unfair for people that were really trying to find their size but these other people had dumped their unwanted clothes in different aisles." For the staff, Ms Wood had only praise. "The staff were amazing that had to be there at the crack of dawn. 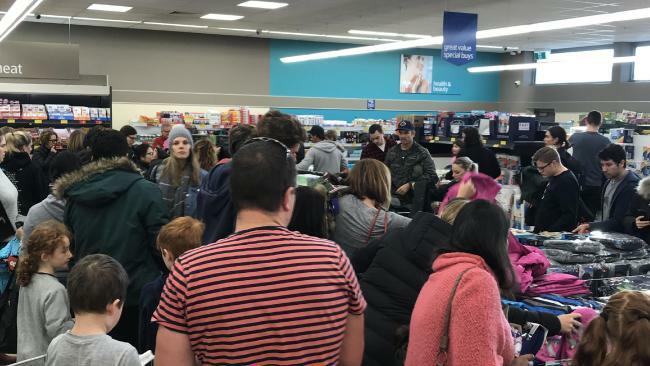 There was one man on the front door making sure everyone got in safe, another in the middle of the aisle to answer questions on products, and another one restocking the bins on repeat." The annual event has its share of critics. Glenn Cullen, who has been writing about the ski and snowboard industry in Australia for more than 20 years, called it a "sh*t show" on his blog The Snow Gauge. "I'm calling for an end to (the Aldi snow sale) in its current set-up and here's why," he started. "Not because Aldi gear isn't at least passably good ... to me it still seems like a great entry point for the casual to semi-regular snow enthusiast. And if it gets more people skiing or snowboarding - great. "No, the problem I have with the Aldi sale is the feeding frenzy concept that it very deliberately creates. I do geddit, you know. It's economics 101. Create a limited supply and then, if your product and the word of mouth is good, develop extraordinary demand. Aldi do it and do it well. Chaos minutes after the doors opened at a Melbourne store. "In the early 2000s you had the major brands and the major stores with their major prices. The casual enthusiast either had to hire or shell out the big bucks. Sure, you might be able to get a cheap winter parka at Kmart - but what about some proper ski pants, a helmet and a dozen other ski-specific things you might need? "Aldi filled that void and kudos to them. But I reckon it has now turned into a bit of a sh*t show and an unnecessary one at that."